It took Merrilyn quite a while to get over her overnight adventure. (You can read Part 9 here if you missed it). She had sore feet for a few days and her poos turned black and runny. She was understandably skittish and did not want to go too far away from me. We resumed our walks, with a watchful eye out for any wild kangaroos that might pass by too closely, but we were all just a bit on edge. Just nine days after Merrilyn's near loss, something else, unthinkable happened. We were walking back up to the house and Buster suddenly took off. Nothing unusual in that but he was heading straight for a rock retaining wall and he'd never jumped that high before. Without thinking, Stephen called out "Stop Buster". Buster complied but he was already in flight and he may have made it over the wall, but his sudden stop meant he smacked straight into it. We raced over to him and he immediately tried to get up, but we could see that one of his hind feet was broken. Stephen and I just looked at each other and then down at the break. Male eastern grey kangaroos can grow to 66kg (145lb). Having solid hind legs is critical to their ability to flee from predators and also to fight other male eastern greys. They stand up on their strong tails and kick out with their legs. If the vet could not heal this break solidly, Buster would have to be put down. Better that than a cruel death. Buster had won our hearts quickly and tears welled into my eyes at the thought of losing him. (You can read about Buster's arrival here.) He was looking at us with such trust. We moved quickly. Securing Merrilyn in her pouch back inside the house and carefully lifting Buster into his pouch. We raced to the vet who took an X-ray and declared, to our relief, that he thought he could fix the problem. The break was down near his toe, not on the main part of the leg, which would probably have resulted in him being put down, and the vet thought a plaster splint might do the job. We spent several hours at the vet surgery and eventually bought him home with instructions that he shouldn't run and to keep the whole thing dry. Well the second was easy - we added a plastic bag around it (or, as we dubbed it, "Buster's condom"). Keeping him from running was going to prove a new challenge. Somehow he was even more gorgeous with his foot in the splint! The question now - would the cast work? Would the break heel properly and leave him with a strong back foot that could take him into adult life safely? Time would tell. If you've missed any of the other parts, just click on the Merrilyn's Story Link on the side bar and they are all there. Thanks to the many of you leaving comments, sending emails, following here and joining the facebook page. You are all very much appreciated and I will be visiting, commenting and following you back and there's plenty more to come in this story. More characters, more drama, more laughter and plenty of tears. Enjoy. Oh and am linking this post to Bee's With Honey's "Let's bee friends Friday" post. We all need new friends! And having forgotten I'd linked it there I've also linked it to By Word of Mouth Musings Time Travel Tuesdays! 20 Leave your lovely comments here please. 2. Between June 20 and 22nd, write one line on what each book is about and then one line on why you liked it. (Teralyn suggest you think of it as a twitter pitch for other people's work. Semi-colons are cheating, but you can use them anyway. 4. If you don't keep a blog put your challenge in the comments section on the day. OK here are mine, the toughest thing being picking 5 books! Pillars of the Earth by Ken Follet. A cathedral is built over several generations of tragedy and hope. I love it for its superbly crafted characters and for its graphic depiction of life in those times. The Power of One by Bryce Courtney. An awkward boy develops into a man with a remarkable understanding of the beauty and the horror of his homeland. This book inspired me to an understanding that no matter what your beginnings, no matter what happens to you along the way, you can still triumph. Life and Death in Shanghai by Nien Chen. The poignant story of one woman's determination to speak the truth, despite torture and solitary confinement for over six years. Another true story that kept me enthralled from beginning to end. A Woman of Substance by Barbara Taylor-Bradford. A girl refuses to be intimidated and rises above those who would put her down whilst enduring love, hate and tragedy. I am just a sucker for poor girl becomes rich successful woman and this was Barbara's best work. So that's my five. What are yours? Have you read any of these books? Leave me a comment and let me know what you thought of them. 28 Leave your lovely comments here please. Merrilyn, the kangaroo joey, Went from her mother's safe pouch to a bag, after her mother was killed by a car. This photo was taken when she was very small. You can see her back legs sticking out and the wire from the thermostat, used to ensure she stayed warm enough. The bag was great when she was small and easy to carry around but not so good for the bigger Buster and also for simply leaving her out on the ground to nibble the grass by herself. We wanted to easily mimic a wild mother eating grass. The mother wanders along eating and the joey has its nose out nuzzling dirt and pulling at grass. We also wanted to be able to change the angle to a mother standing upright style. On a visit to another wildlife group we spotted a stand and my then other half took a sketch and developed one of our own and a pouch that would work with it and this is what we came up with. Doesn't make much sense looked at just as a stand, so let's add the pouch and give you the two views. Here are a couple with pouches and on their side as if Mom is eating grass. And here it is standing. I know a few wildlife carers are following this blog, so if you want full details on how to create a stand and also the pouch design that goes with it, you can find it in my wildlife care manual. Here's the link that takes you to Macropology. (It's free to download). If you want to catch up with the rest of the story you can do that here. Something different today - a post without a kangaroo story! Yes this is the place to come to read of the beautiful creatures I share my world with and particularly the story of Merrilyn, who arrived as a fur less joey and who carved a special place in my heart, but not today! That's Merrilyn on the left with her big "brother" Buster. I post Merrilyn's story every Friday, and if you would like to read the first 7 parts you can find them all here. 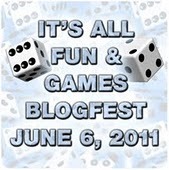 So onto the blog fest. I take part in these from time to time as I find them a great way to "meet" new people. I'll be hopping my way through the list to see who's out there and what they are doing. Many thanks to Alex J. Cavanaugh for hosting this one. Alex works in web designs and graphics and he loves Sci-Fi. His first book, CassaStar was released last year and he's working on a sequel. If you don't know him already pop over and say G'day. (Hello). Our instructions are to post about our 3 favourite games. I'm a writer who loves words so the classic, timeless, game of Scrabble had to be there - and mainly it's facebook scrabble for me these days. I love it as it stretches my brain, it keeps me in touch with friends in far flung places and, if I ever set a novel in the USA I'll be set as it's teaching me great new words that would certainly not be allowed in the board version of Scrabble here in Australia. The second game is UpWords. Yes it's another word game. I find many of my friends find it a lot less challenging than Scrabble as you can build up as well as on, so you're better off with shorter, simpler words. If you love Scrabble, but can't get friends to play it, try UpWords. It's quick and a lot of fun. Leaving the best 'til last, My third all time favourite game is one only I can play. I have two Abyssinian cats, Libby and Simba. They live indoors, (cats do too much damage to Aussie wildlife to let them roam here), so I do my best to keep them entertained and I always spend 15 minutes playing with them before we all head for bed. Abyssinians stay kitten like and love to play at any age. They chase toy mice up and down the hallway, or feathers attached to elastic and a pole - my favourite kind of fishing, or we simply chase each other around the house - I'm always the first to give in, they have the greater amount of energy. Meet Libby and Simba - all together now say aaahhhhhh. So there's my 3. I'd love to hear your comments and also please hop around the others entered into this blog fest. You might like to join in yourself. Kangaroos have very definite personalities. Merrilyn could definitely be described as feisty on the outside, but pure marshmallow on the inside. The marshmallow showed when she sucked her tail! If she was still with her Mom she would be sucking on a teat. It's a comfort thing. When the joey hops back into the pouch they search out the teat to hold onto. As they grow they still dash back to mom and pop their heads into her pouch to hold onto a teat. (Kangaroos have 4 teats and can produce two different types of milk at the same time - one for a new in pouch joey and one for an older joey at heel). I was never too worried about tail sucking in a joey. (Sucking feet and bottom bits is a different story...) For small joeys, who would normally be attached to the teat most of the time, we used a "dummy" - a bottle teat without the hole in it. Merrilyn, being too big for a dummy now, chose to use her tail instead. As she grew she started coming out more and more and going on short walks around the property. Don't think dog on a lead - the joeys just followed, free as a breeze, with Merrilyn hopping back into her pouch, which I carried, more often than Buster. Those who read Part 4 will have met Buster and know that Merrilyn, though not even able to leave the pouch at that point, still let Buster know he was in her territory! The relationship quickly changed to Buster becoming the adored big brother and wherever he hopped off to, little Merrilyn would follow eagerly in his wake. If I sat down they'd both come and jump on me and settle in by my side. This is my favourite photo of the two of them on one of these early walks. I call it - almost a kiss! Sunday is World Environment Day so spare a thought for the natural environment or join in an activity to show your care and respect for the other creatures we share this planet with. There are many activities planned, including a clean-up around Mount Everest and a music festival in Belgium. Maybe there's something happening close to you? You can find out more here.